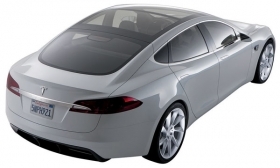 Tesla Motors is steadily getting capital together to tool up a plant for its second vehicle, the Model S sedan. Tesla hopes to raise $100 million to $200 million from an initial public offering. The company also has attracted investment from Daimler and individuals and is getting a $465 million loan from the U.S. Department of Energy. But CEO Elon Musk has one stubborn perception problem: Many people think the federal loan to the Palo Alto, Calif., maker of electric vehicles was part of the federal auto bailout. Musk says that's because the loan was announced last June during the General Motors and Chrysler crises. Nearly a year later, the mistaken notion persists. "It is one of my pet peeves that people still think we got bailed out," Musk said in an interview last week. "I still encounter intelligent, otherwise well-informed people who say, 'Thank goodness you got that bailout.' "
Musk says Daimler's equity investment in May 2009 provided the young company with needed cash. The federal loan to Tesla just started arriving and is limited to engineering and production work for the Model S.
"Our first disbursement only occurred a few months ago, so it could not have been what bailed us out," he says. "If we'd needed the cash from the DOE loan, we'd be screwed." And one more thing: "It's a loan, not a grant. We have to pay it back."